ENSENADA, Baja California, Mexico —One is a jovial, ever-smiling middle-aged Texas businessman, the other a cordial, chiseled, youthful rally racer from Mexico City. 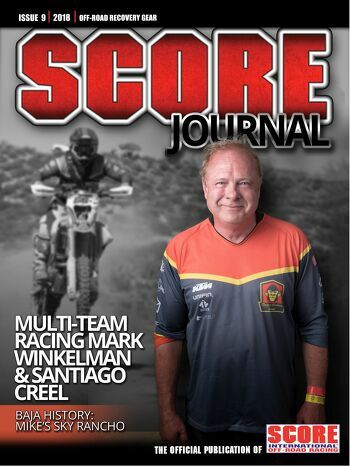 Together Mark Winkelman and Santiago Creel are making waves in the 2018 SCORE World Desert Championship and they along with their ‘Monkey Business Racing’ team are spotlighted this month in Vol. 4, No. 9 of the acclaimed SCORE Journal digital online magazine. In addition to the in depth story on the principals of Monkey Business Racing, this issue also includes several additional feature stories including a special review and update on SCORE race safety initiatives and another colorful story on the legendary Mike’s Sky Rancho as well as several SCORE News items and another unique industry update. The SCORE Journal digital magazine’s May 2018 issue surpassed 2 million unique viewers/readers. The newly produced live streaming format recorded 294,994 live views on race day of the SCORE Baja 500 and for the 10 day period surrounding the event, including race week, the SCORE website audience numbers eclipsed 1 million unique viewers. Vol. 4, No. 9 of the SCORE Journal is once again filled with numerous interesting worth-reading features, stories, exciting videos and several news items. This edition is anchored around a detailed look at the expanded Monkey Business Racing team put together by SCORE class champion racers Mark Winkelman and Santiago Creel. In the SCORE News section, the major story is a look at the history of the expanding Lucerna Hotels and Resorts of Mexico, the first Official Hotel in the history of SCORE. There is also an announcement regarding the massive SCORE Baja 1000 exhibit at this weekend’s Lucas Oil Off-Road Expo at the Fairplex in Pomona, Calif. The Off-Road Marketplace in this issue continues to shine brightly on the latest off-road products for 2018 for racers and enthusiasts. Featured this month is our SCORE Recovery Gear Guide. SCORE races in 2018 are airing on the El Rey Network domestically and around the globe on ESPN International and syndication. The SCORE Baja 1000 will air as a two-hour special for race coverage.